Ferenc Puskas is one of the top 25 footballers of all of time, and while his better performances came with the Real Madrid jersey, he also helped his Hungary national team to international glory. He didn't have the look of most footballers at that time or even now, but his qualities on the field are undeniable and for what he has done for club and country he has carved his place in footballing history. He made his debut for Hungary in 1945 at the age of 18, in a match against Austria. This was Hungary's first post war match. Puskas also played in the incredible Hungary team that defeated England 6-3 at Wembley, becoming the first team outside of Britain to defeat England at home. 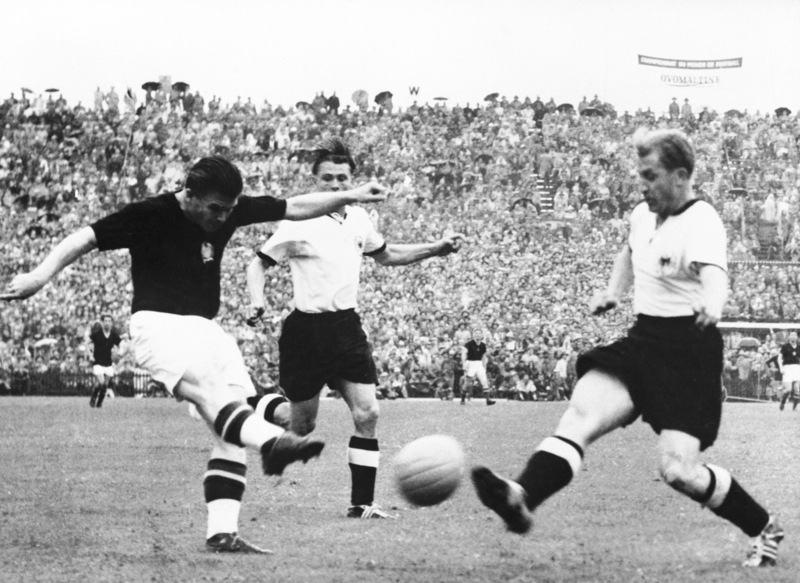 Hungary & Puskas were undefeated in 4 years when they arrived at the 1954 World Cup in Switzerland. That streak looked to continue when they defeated South Korea 9-0 in the groups opening game. Puskas scored 2 goals in the match, the first at the 12th minute to give Hungary a 1-0 lead and his 2nd goal made it 9-0 in the 89th minute. During the second game of the group Hungary defeated a strong West German side 8-3 with Puskas scoring the 2nd goal for his team at the 17th minute mark. After two games and 4 years undefeated leading into this tournament, Puskas and Hungary looked set at making history. Due to an injury that had been with him since the end of the club season and was aggravated during the first two games, he wasn't able to help his Hungary during the QF match against heavy favorites Brazil. His team mates rallied around him and made of this weakness a strength and in a match commonly know as "Battle of Berne", Hungary defeated Brazil 4-2 and advanced to the semi-final. The semi-final pinned Hungary against the defending champions Uruguay, still without Puskas, Hungary looked right for the picking, but in football sometimes the variables play a role. To many his presence with the team, and his willingness to win gave his team mates the strength to push on and try to overcome this massive obstacle. Uruguay was defeated 4-2 in AET, and the stage was set for a final between Hungary and West Germany whom they had defeated 8-3 earlier in the tournament. Puskas forced the coaches hand and put his name on the lineup, despite not being fully fit. Hungary took an early lead with Puskas scoring the first goal only after 6 minutes of play. By the 8th minute of the game Hungary lead 2-0 and look to be set at winning the tournament. The West Germans weren't undone and made a remarkable comeback, and won the game 3-2. It was a shocking result, and one that ended Hungary's unbeaten streak of 4+ years. This was Puskas only World Cup appearance, but in 84 caps for Hungary he scored 83 goals. Nobody in history has ever scored those many goals for a national team. The thoughts always linger, what would this 1954 World Cup have been, had Puskas been fully healthy for the duration of the tournament? That is something we will never know.